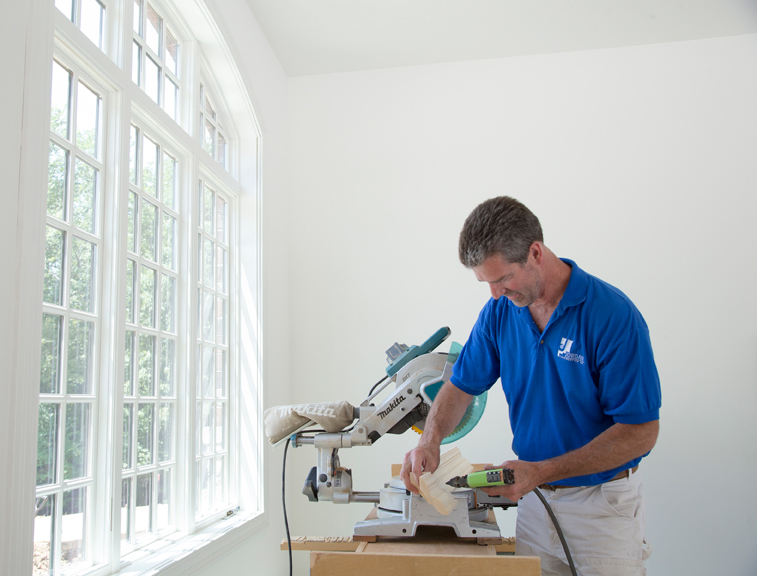 Master craftsman Tim McKinley dreams up creative solutions for St. Louis area homeowners. As Tim McKinley flipped through photos of the custom-made wood cabinetry, bars, bookshelves and more that he crafts, it was clear that the only thing greater than the elegance of his work is the humility with which he performs it. “I’m just a guy with a pickup truck full of tools. I do what I do and thank people along the way. I’m so grateful that I get to do this,” he says, as he showed me an elaborate wooden deck he built, complete with a stone firepit at one end and a sunken hot tub and pergola at the other. After his father-in-law passed away, McKinley worked as one of a handful of “finish carpenters” for a local homebuilder. Then, 14 years ago, he started his own business, named Jordan Construction after the youngest of his three daughters. Today, McKinley seems slightly embarrassed by the title master craftsman, and simply says he has been a carpenter for roughly 30 years. However, problem solver is probably a more accurate job description. One such problem was an intricate ceiling McKinley constructed for a customer in west St. Louis County. The customer had shown McKinley a picture from a magazine, which featured a hardwood ceiling, crisscrossed with rope moulding that was hand-carved in Mexico. Adding to the challenge was the fact that the customer’s original ceiling was plaster – an unforgiving material. First, McKinley fastened 1" x 4" pieces of wood to the plaster, and then laid a new hardwood ceiling over them. He found a reeded moulding made here in St. Louis, and designed a pattern using it. The end result gave his customer the look she wanted from the magazine photograph, but saved her time and thousands of dollars. “Most of my jobs like that, when it’s done, people are thanking me. But really, it’s me thanking them. I thank people a lot when they give me the opportunity to make something like that,” McKinley says. Having done so much, what would be his dream project? McKinley thought about it, and then said that he’d enjoy building a custom bar for an actual bar or restaurant, where it’s on display to the public. “One of my nicer projects that I’ve always liked was a bar I built for a friend, but only a few people have ever seen it. I’d like to work on a bar in commercial environment that everyone could see.” That, surely, will be a fun problem to solve.